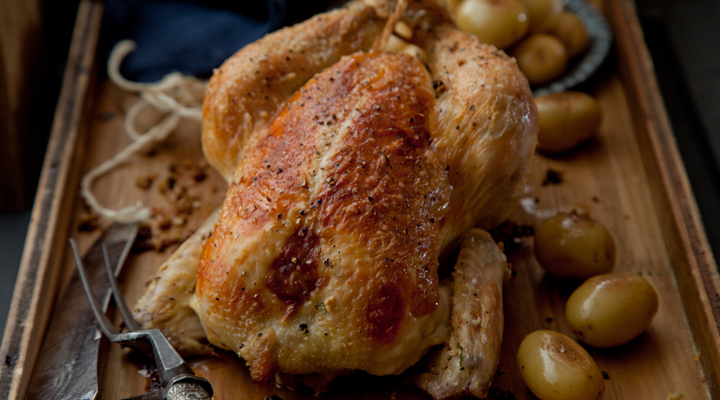 Try this delicious chicken and stuffing recipe, inspired by the traditional Scottish dish, skirlie. To make the stuffing, melt the butter in a saucepan set over a low heat, then add the onion and garlic. Cook for about 5 minutes, until softened. Mix in the oats, breadcrumbs, lemon zest and chopped herbs. Season lightly and set aside to cool. Stuff the cavity of the chicken with the cold stuffing and tie the chicken legs together with butcher twine. Place the chicken in a roasting tin. Loosen the skin of the chicken and gently massage the softened butter into the breasts. Season the skin generously with salt and pepper. Place the chicken in the oven and roast about 90 minutes, until the juices run clear when you pierce the thighs. Serve the stuffing on the side along with roasted potatoes.